With a hand-drawn large floral arrangement and additional flower and leaf images, this stamp set has the perfect elements to create beautiful cards! The bouquet image can be stamped, colored, or embossed. The supporting flower and the leaves can be popped over part of the bouquet or used independently if you prefer to create your own floral arrangement. 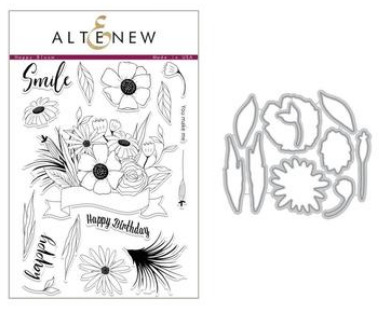 These flowers will be the perfect addition to your stamp collection! The larger die measures about 1.7" x 1.6" while the smaller die measures about 0.6" x 1.1".